Cleveland, OH – 4/20/15 – Solus Lighting LTD received three International Special Events Society Ohio WOW Awards in the categories of Best Event for a Non-Profit Organization, Best Public Event, and Best ISES Event Volunteer Collaboration. 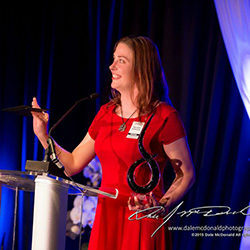 The awards ceremony was held on Friday, April 17th at the Ivory Room in Columbus, OH. ISES Ohio Wow is an annual awards program created to showcase, acknowledge, and honor the special events industry’s finest examples of creativity, planning, strategic management, resourcefulness, and successful solutions throughout the state of Ohio. To maintain fairness in the judging, the submissions are entirely anonymous and are judged by event professionals from another region of the United States. This year, judges for the awards were located in Austin, TX. The ISES Ohio Wow Awards celebrate the extraordinary efforts, performance, and outstanding contributions of industry professionals – rewarding excellence and recognizing the best.